Back in October, 20th Century Fox unveiled the first Logan trailer, which received quite the positive response from fans. The studio has yet to confirm when the second trailer will debut, but they did showcase new footage during a presentation in New York City earlier this month, although it's not likely that footage will be made public. 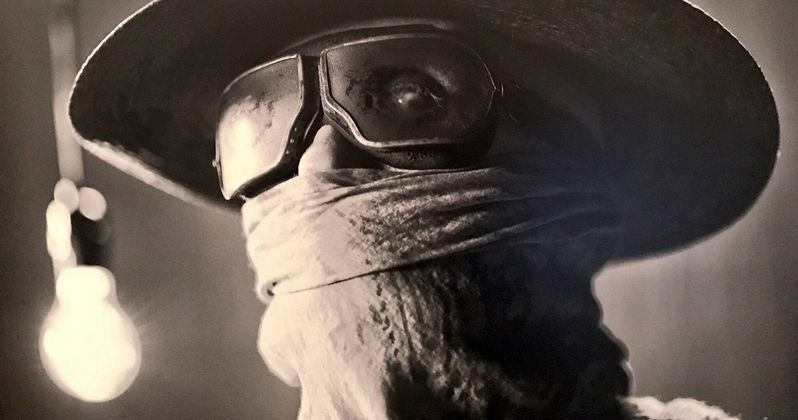 While we wait for more on this superhero adventure, which marks the last Wolverine movie for Hugh Jackman, two more photos have surfaced, giving us closer looks at Caliban (Stephen Merchant) and the villainous Donald Pierce (Boyd Holbrook). These images first surfaced on Twitter, showing Caliban in his protective scarf as we've seen in previous images. But this photo shows Caliban also wearing a hat and goggles. This character is an albino who lives underground in a cave, with this character using his scarf, hat and googles to protect his skin from the elements. As for the second image of Boyd Holbrook's Donald Pierce, he's seen standing next to a heavily-fortified truck, which has a machine gun mounted to the roof. There are other characters seated inside the truck, but we can't quite make out who they are. It's possible that they're members of the Reavers. During the special presentation last month, fans were given a glimpse at the first 40 minutes of the movie, which was given high praise in the early reactions that surfaced on social media afterward. Most of the critics loved young Dafne Keen's portrayal of the mutant clone X-23, whose presence is teased during the post-credit sequence in X-Men: Apocalypse, when an unknown character is seen grabbing a vial of blood labeled "Wolverine." In the comics, Laura Kinney, a.k.a. X-23 was cloned from Wolverine's blood, the 23rd attempt at a clone, and the only successful one, hence her. We recently learned that Richard E. Grant is playing Dr. Zander Rice, through another photo that debuted on social media. In the comics, Zander Rice is one of the men who essentially created X-23. It remains to be seen how large of a role Dr. Zander Rice will have in Logan, which is partially inspired by the iconic Old Man Logan comics. In those comics, Logan loses his mutant healing abilities and finally starts to age. The comic also features a number of characters that Marvel Studios holds the rights to, such as Hulk, Hawkeye and Red Skull, which is likely one reason why this movie won't be a straight-up adaptation. The cast also includes Patrick Stewart returning as Professor X, although it may be the last time we see him as this iconic character. It has been widely reported that Caliban is helping Logan take care of the ailing Professor X, who has grown so ill that, at times, he forgets who Logan even is. One of the other cryptic photos that surfaced on social media featured Logan's limousine with one of the passenger doors riddled with bullet holes. Fans who have analyzed the trailer surmised that Professor X is sitting in that same spot, which could hint that Xavier will be killed off in Logan. Take a look at these new photos below, as we wait for more on Logan.